Boyd, Joe Dan. “Judge Jackson: Black Giant of White Spirituals.” Journal of American Folklore 83, no. 330 (1970): 446–51. Solomon, Olivia, and Jack Solomon, eds. 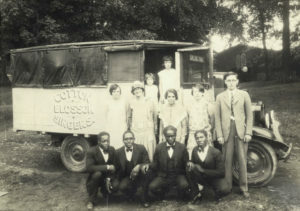 “Honey in the Rock”: The Ruby Pickens Tartt Collection of Religious Folk Songs from Sumter County, Alabama. Macon, GA: Mercer University Press, 1992. Terrell, Clemmie S. “Spirituals from Alabama.” Journal of American Folklore 43, no. 169 (1930): 322–24.